The term “mole mapping” has been used in several different ways. However, it usually refers to a surveillance programme for those at high risk of malignant melanoma. It may include a clinical skin examination and dermoscopy to identify and evaluate lesions of concern. Mole mapping might simply involve marking spots on a cartoon drawing of the body to indicate the position of skin lesions of concern, particularly moles and freckles. Mole mapping is more likely to refer to conventional print photographs or digital images of the whole body’s skin surface. These can be reviewed at a later date to see if there are any new skin lesions, or whether pre-existing skin lesions have grown or changed colour or shape. 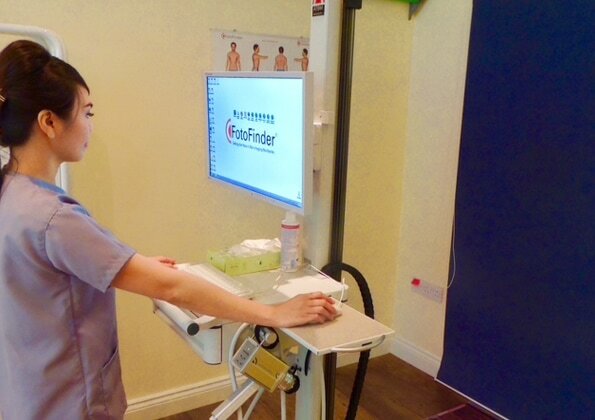 At Sunnex Dermatology, we use the Fotofinder System which applies state of the art technology in automated whole body photography combined with digital dermatoscopy. The system uses a specialist software allowing early detection of suspicious changes in skin lesions. Lesions of concern are those that have features consistent with melanoma or other form of skin cancer (such as basal cell carcinoma or squamous cell carcinoma). Characteristically skin cancers enlarge or change over periods of weeks to months. If you are concerned about a skin lesion, or you are at high risk of skin cancer, have a full skin examination by an experienced doctor. For more information on Mole Mapping and Moles & Melanoma's please visit www.moledoc.co.uk.